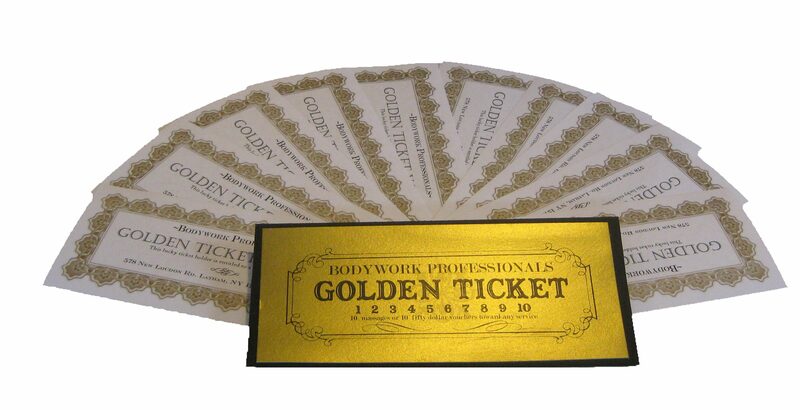 The Golden Ticket is a pack of ten 1-Hour or 90-Minute Massage or Bodywork session vouchers. It’s back! With something new! Our famous Golden Ticket comes out just once a year for the holidays, and it is something not to be missed. A package of 10~ one hour massage or bodywork sessions or NEW 10~ 90 minute massage or bodywork sessions at our lowest prices of the year. We issue a limited number of Golden Tickets (50) each year and they are very popular with some of our most beloved clients. We’ll put all of your session on an your account for you to use anytime you’d like. You can share them with friend or family just by letting us know. We can give you a special Golden Ticket card to keep track of your appointments. A certificate is worth the printed time on the front to be redeemed for a massage or bodywork session. Certificate must be presented at time of service. Certificates may be given as gifts and redeemed by anyone. Certificate cannot be used as tips or to receive cash back. Gift Certificates never expire, however certificates redeemed after 1 (one) year from date of purchase are subject to current pricing and rules.